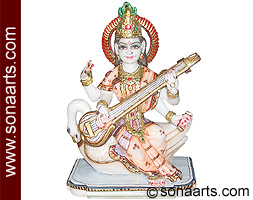 This marble Saraswati is seated on her vahana, a swan, playing a veena. In her two other hands she holds a copy of the Vedas and a string of malas. The goddess of wisdom has a compassionate smile and a twinkle in her eyes.